Decent Work Country Programmes are the ILO’s programming instrument at the country level. They provide a framework that identifies the priorities of ILO constituents in a country and specifies the planned support of the Office to the achievement of results under those priorities. Since 2010 over 100 member States have developed new DWCPs, including second or third generation DWCPs, which cover an analysis of the context for decent work in the country and a prioritized set of time-bound outcomes. The outcomes in DWCPs are linked to the strategic outcomes and indicators identified in the Strategic Plan and the Programme and Budget. DWCPs are developed with full participation of national governments and employers’ and workers’ organizations and are implemented with their active engagement. They constitute the ILO’s contribution to the wider UN effort in a country and provide a vehicle for steering the Office’s collaboration within the UN system and with other partners at the country level. Country ownership and results orientation are key aspects of ILO's Development Cooperation. 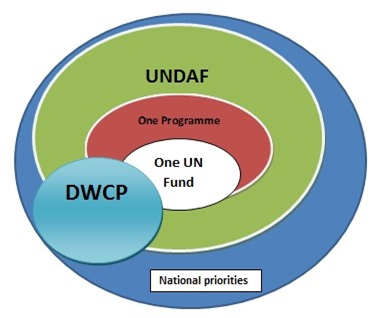 Through their results frameworks, ILO programmes support country priorities identified in DWCPs. ILO's programming approach promotes synergies and seeks complementarity of operations, bringing together diverse sources of funding for the achievement of common outcomes, greater scale and impact. The ILO manual on Development Cooperation (2015) provides staff with guidance, rules and regulations on results-based management of DC projects and programmes. It covers each step of ILO's project cycle management.